No solvents, free technical advice, call.01626 331351. 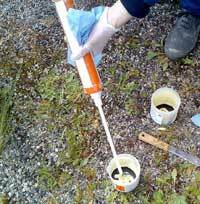 Epoxies for repair jobs - fast and slow set versions, injection cartridges, nozzles and injectors. 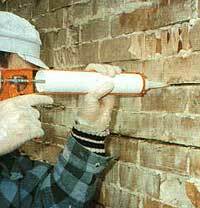 (for holes and slots in wood, masonry or metal - only moves when pushed - like Vaseline/Swarfega in consistency). Available in clear, red and grey ex stock, other colours to order. on timber, screed, concrete - filler/adhesive - (two grey creams, easy to mix and spread - no shrinkage, totally waterproof, flexes). Epoxy adhesives, together with epoxy putty, epoxy primer and epoxy pouring resins form part of our extensive range of epoxy and polyester resins. (often referred to as chemical anchoring). For further help call us for free technical advice on 01626 331351. See examples of Projects incorporating some of these materials below. 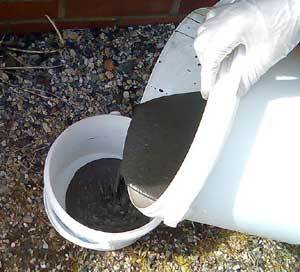 Three part epoxies, supplied as two liquids and separate aggregate, in a large plastic mixing tub. Carbon and Steel bars and plates, as part of a composite, reinforced repair structure. The Resin version is thinner than the Grout version - to decide which is best for your Project call 01626 331351. 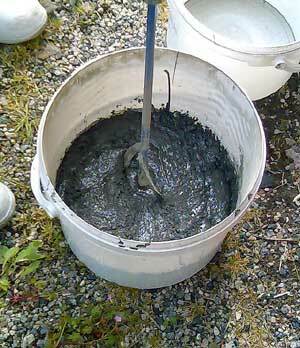 Mixing Structural Pouring Grout. Pouring Structural Pouring Grout. 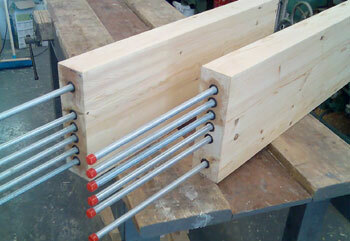 Example: pouring into a beam repair shutter box. the Structural Epoxy Pouring resin then completing the composite, reinforced repair structure. We manufacture new Timber Beam Ends and Mid Sections for Rafters, Purlins, Carrier Beams, Ridge Beams, Joists and Glulam Beams. 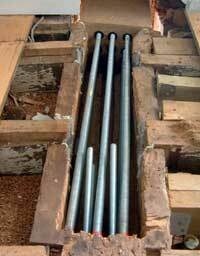 Example 1 - Joist Ends - the joist ends above an occupied flat were badly affected by Dry Rot. with pre-bonded epoxy coated steel re-bar connectors. 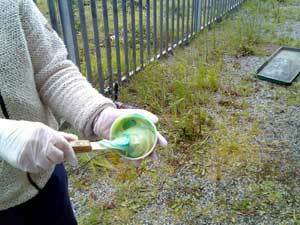 The pouring resin here is in a two pack, 1 litre pot, for small repairs. Joist end Timber-Resin Splice repair during pouring. 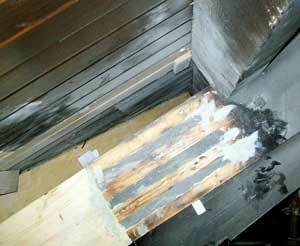 Example 2 - Rafter Ends - the rafter ends in a Cardiff Chapel were badly affected by Wet Rot. Rafter end Timber-Resin Splice repair after injection. A two part thixotropic epoxy resin, supplied as two stiff gels, in mixing pots suitable for directly filling plastic disposable cartridges. as part of a composite, reinforced repair structure. Thixotropic Resin is available as standard and Slow Set versions. Vividly coloured parts make for easy mixing. Rapid Setting version available - Thixo Rapid - hard in 6- 8 minutes. Mixing Thixotropic Resin - 400cc cartridge in standard skeleton gun. Example of Thixotropic Epoxy Resin in use - injection of wall slots and cracks. 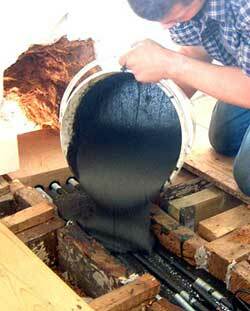 in Epoxy Resin or Polymer Modified Cements. In this example Thixotropic Injection Resin is being laid into a 'stitch' slot, ready for a bar to be embedded.